"At long last, I've found a book that I can hand to weary parents with the confidence that they can learn to help their baby sleep through the night--without the baby crying it out." --William Sears, M.D., Author of "The Baby Book"
"When I followed the steps in this book, it only took a few nights to see a HUGE improvement. Now every night I'm getting more sleep than I've gotten in years! The best part is, there has been NO crying!" Are you suffering through sleepless nights and having to fend off a barrage of heartless advice about letting your baby "cry it out"? "The No-Cry Sleep Solution" will show you how it is entirely possible and within your grasp to help your baby fall asleep peacefully--and stay asleep all night long. Don't let sleep deprivation keep you from enjoying your baby. 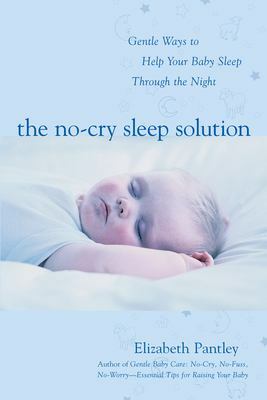 "The No-Cry Sleep Solution" is full of reassuring advice and words of wisdom from other parents who have had success with the program. It will give you the tools you need to effectively and gently reach your goal--a good night's sleep for "everyone." Used Like New (3 available) Book in almost Brand New condition. 100% Money Back Guarantee. Shipped to over one million happy customers. Your purchase benefits world literacy!